You can remove stories from the story list by using the filter selection right above the list of stories, next to the sort order. Here you can see if a filter has been applied to the list of stories. In figure 1, we see that the filter is set to show only stories that have been translated into the selected target language. Hide not translated stories: Only stories for which all sentences have translations available in your target language will show up in the list of stories. 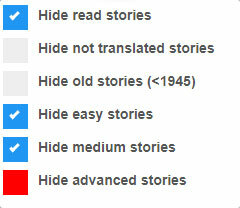 Hide old stories: Stories from before 1945 will not be shown. Once you've set a filter for the list of stories, you will see an 'x' appear right next to the filter (figure 4). You can clear the filter by clicking on the 'x'.